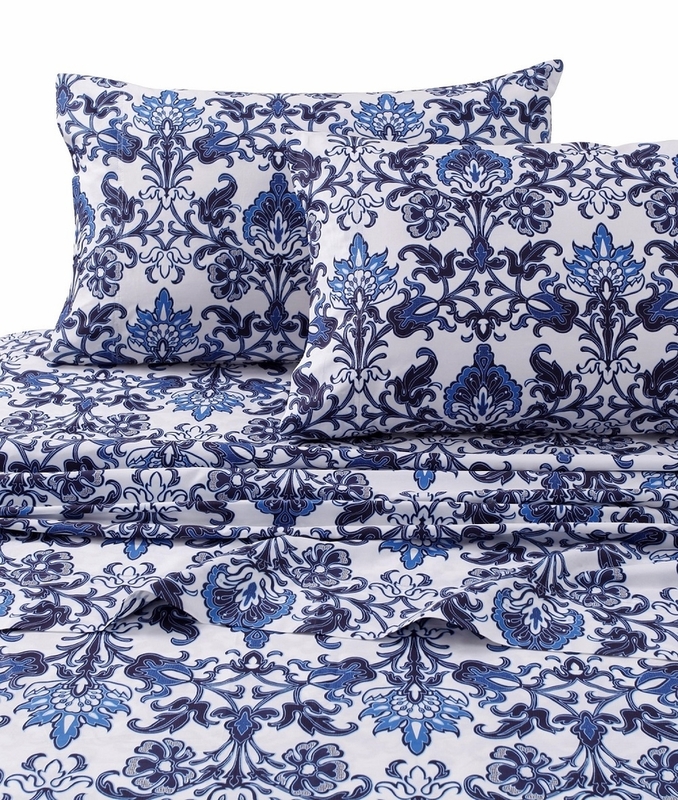 Woven of smooth and crisp 300 Thread Count Percale, this sheet set features an exotic floral pattern in deep and vibrant blue hues on white ground to complement any bedroom d�cor and includes oversized flat and deep pocket fitted to fit most mattresses up to 22" deep and two pillowcases(one in Twin sizes). Machine Washable. > 300 Thread Count Sheets. > Percale weave for smooth and crisp feel to the touch. > Single-Ply which enhances overall strength and softness. 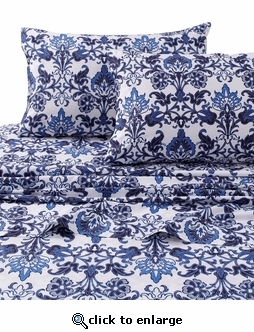 > Features floral print in deep and bibrant blues to coordinate with a variety of bedding collections. > Fitted sheets are extra deep fitted to fit mattresses up to 22" deep. > Set includes one oversized flat sheet, one extra deep pocket fitted sheet and two pillowcases(one in Twin sizes). > Available in Twin, Twin XL, Full, Queen, King and Cal King sizes. * One Oversized flat sheet - 112" x 106"
* Two pillowcases - 20" x 40"
* One Oversized flat sheet - 90" x 106"
* Two pillowcases - 20" x 30"
* One flat sheet - 112" x 106"
* One flat sheet - 96" x 84"
* Two pillowcases - 21" x 30"
* One flat sheet - 66" x 94"
* One pillowcase - 20" x 30"
* One flat sheet - 66" x 102"
Woven of luxurious and smooth 300 Thread Count with percale weave, this sheet set offers multi-color enchanting floral motifs against a light taupe ground to brighten up your bedroom and bring a designer, modern look to your sleep place. This sheet set includes oversized flat and deep pocket fitted to fit most mattresses up to 22" deep and two pillowcases. Machine Washable. > Features multicolored floral print to coordinate with a variety of bedding collections. Experience luxury with these smooth, crisp and durable percale sheets, this sheet set showcases 350 thread count construction and feature inverted pleat detailing along the cuff on pillowcases and flat sheet. This sheet set includes an oversize flat sheet and extra deep pocket fitted sheets that fit mattresses up to 23 inches deep. Queen sets include extra deep pocket fitted sheet, oversized flat sheet and two standard pillowcases. King and California King sets include extra deep pocket fitted sheet, oversized flat sheet and two king pillowcases. > 100% Egyptian Cotton Percale. > Percale weave which makes them smooth and crisper to the touch. > Sturdy, Longer lasting and holds up better to washing. > Extra Deep Fitted Sheets. Fitted Sheets are extra deep pocket that fit mattresses up to 23" deep and featuring all-around elastic on the fitted sheet for a perfect fit. > 350 Thread Cuunt Solid Sheets. > King, Queen, Cal King sizes. > Colors (Light Ivory, Lavender, Silver, Green). Update your bedroom with the sophisticated multicolored floral printed Casablanca sheet set. Woven of 300 Thread Count 100% Cotton Sateen and crafted of one-ply yarn which enhances overall strength, softness. Sateen weave which gives soft, lustrous and smooth to the touch. Set includes one oversized flat sheet, one extra deep pocket fitted sheet and two pillowcases(one in Twin sizes). Machine Washable. > Sateen weave which gives soft, lustrous and smooth to the touch. > Set includes one oversized flat sheet, one extra deep pocket fitted sheet and two pillowcases(one in Twin sizes). .